Just 82 Premier League games remain to be played this season, and it’s great fun trying to predict the outcome. Using historical results based on previous Premier League meetings, sportingintelligence has projected the end-of-season table for 2010-11. The full explanation of how we reached our conclusions is elsewhere today. It’s going to be close, very close, at the top and at the bottom. 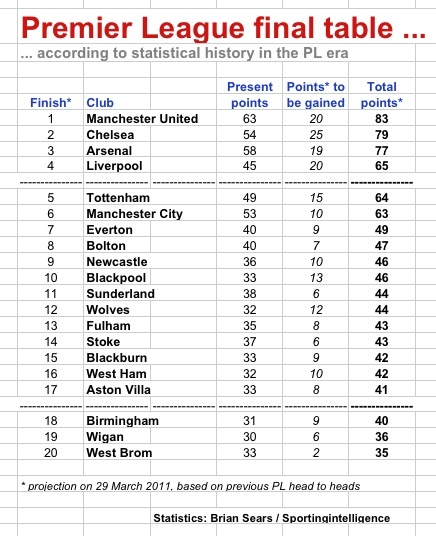 But the stats say, at this point in time anyway, that West Brom, Wigan and Birmingham will go down. For the full projected table, see below. Anyone wanting to predict the top four and bottom three can do so via Twitter, to @sportingintel, and use the hashtag #PLtop4bottom3. As and when they come in, we’ll post them as comments on this article; some comments are already there – see below.